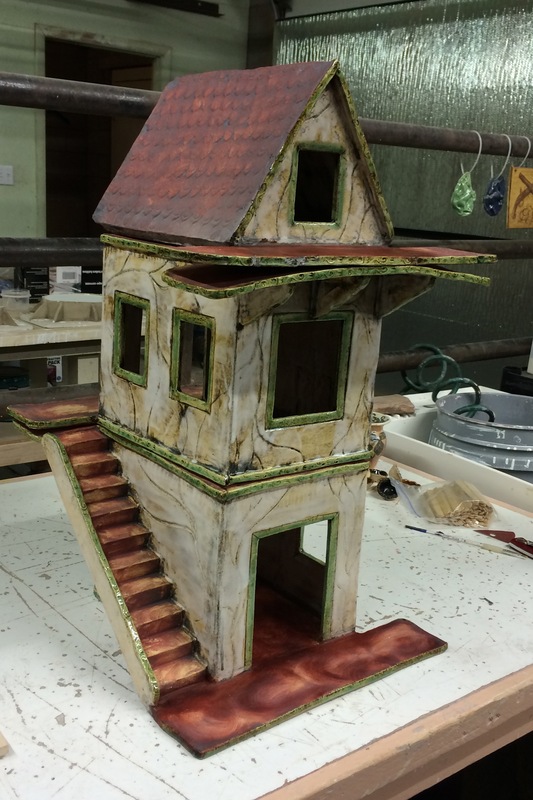 Once the molds were dry, the build began immediately. I have not worked extensively with stiff slabs and there was a bit of learning curve. The procedure was pretty straight forward. All the pieces were pressed in a day and left in the molds to stiffen. the next day they were sprung from the molds and assembled. the floor, then the walls, one at a time, and finally the ceiling. once the main floor is built, the details and stairs are added on the following day. The schedule for completion was very tight, so these had to go to the kiln pretty quickly. 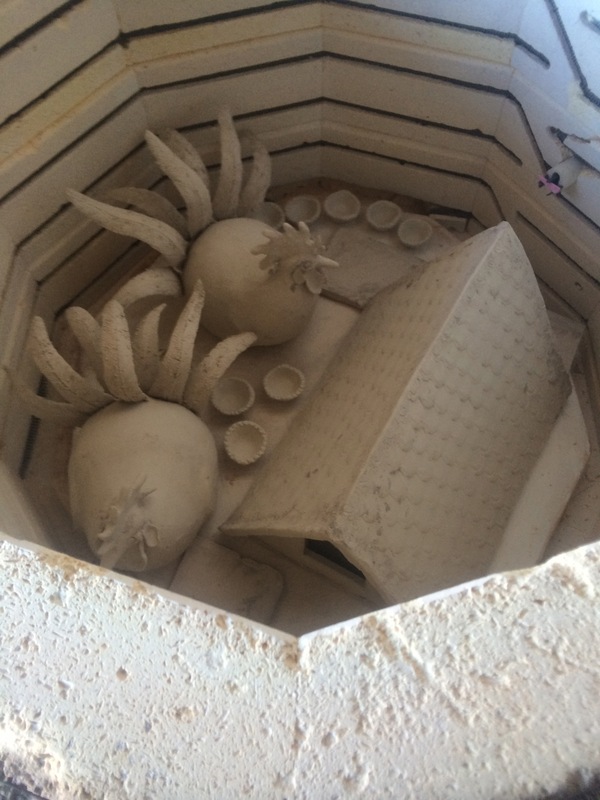 The large stories completely filled the kiln. 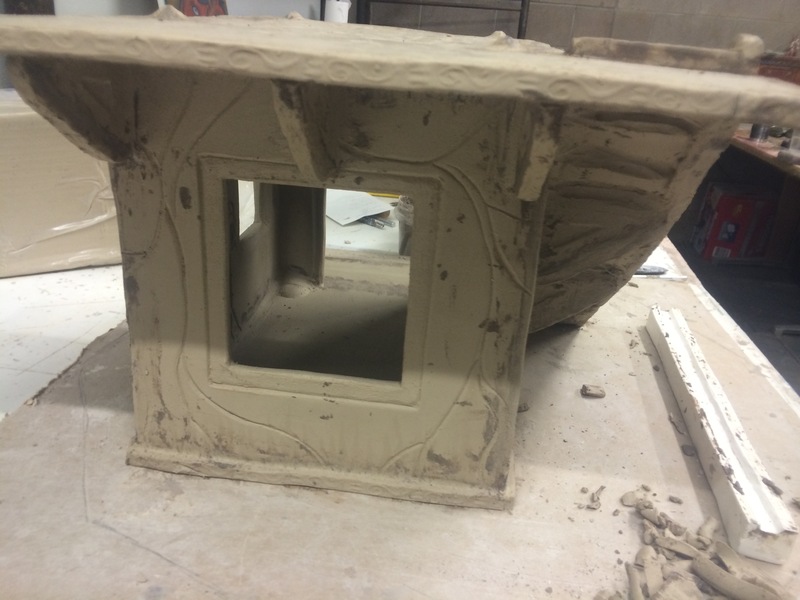 This was actually one of the main design parameters, the small kiln is our studio’s limit, transcending that limit has been a priority of ours from the beginning. This small kiln also lacks the computer controls that I was used to at the art center. It was an unfortunate combination of dirt barn floor, that prevented drying, small hot kiln and no way to read internal temps that cost us much time and stress on the build of the piece. The first piece blew up in firing. the tight schedule and the stress of deadline pressure, constant cold from working in the old barn and months without a day off piled up. All these factors contributed to the loss of the piece and certainly to my willingness to give up and bring the work incomplete to critique. I assumed it would cost me my grade and I was ready to take the incomplete in the class as well. But of course I don’t work alone, and after a day to cool down and refocus with the support that is sometimes necessary for hard work, I got back to work and remade the missing piece. That piece was not nearly the only work lost in the early winter and we employed a variety of methods to get the clay dry in the damp, cold barn. 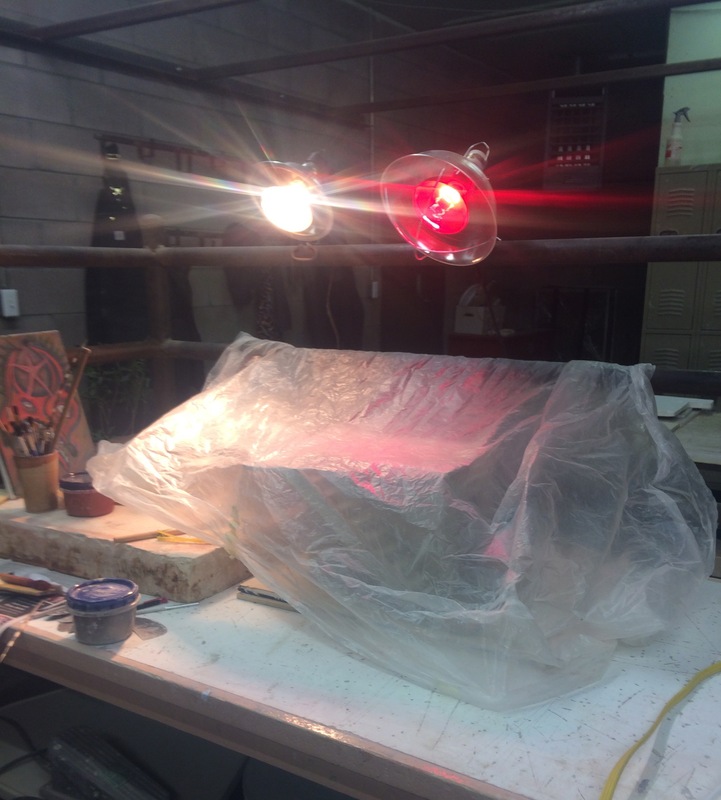 The first attempt was to use heat lamps to dry the work before firing. This worked pretty well for the pre firing dry time, but we were still loosing work, those roosters had to be remade three times. 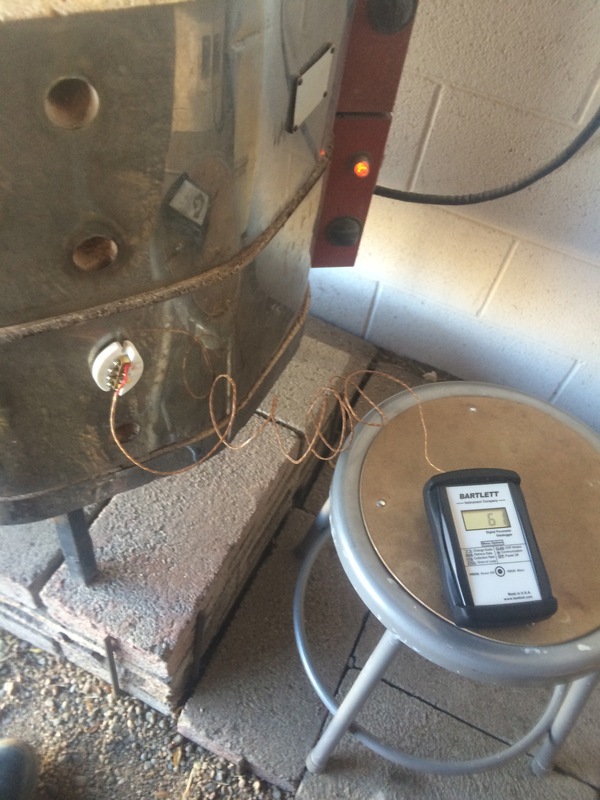 Finally we ponied up the money for a pyrometer, which has been one of the best investments the studio has made to date. Now we are able to monitor the interior temp and ensure it does not climb to high before we are sure the work is completely dry. For our situation, its completely necessary. 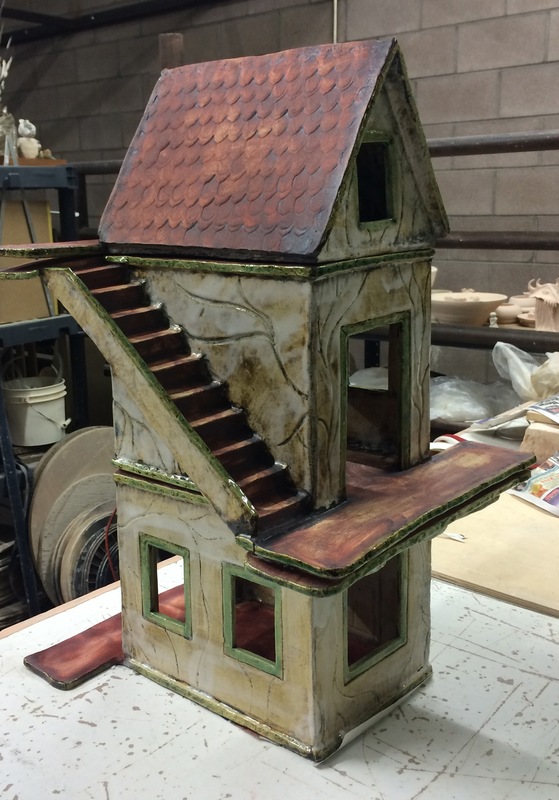 Once all the work was fired and repairs made to the porch pieces, which were a design flaw and needed much post firing attention, the work was glazed. The film was a primary consideration here, I needed to choose a surface that would show the characters and film well. I was also concerned with the characters being able to keep their feet so an unglazed surface was chosen for the floors and stairs. 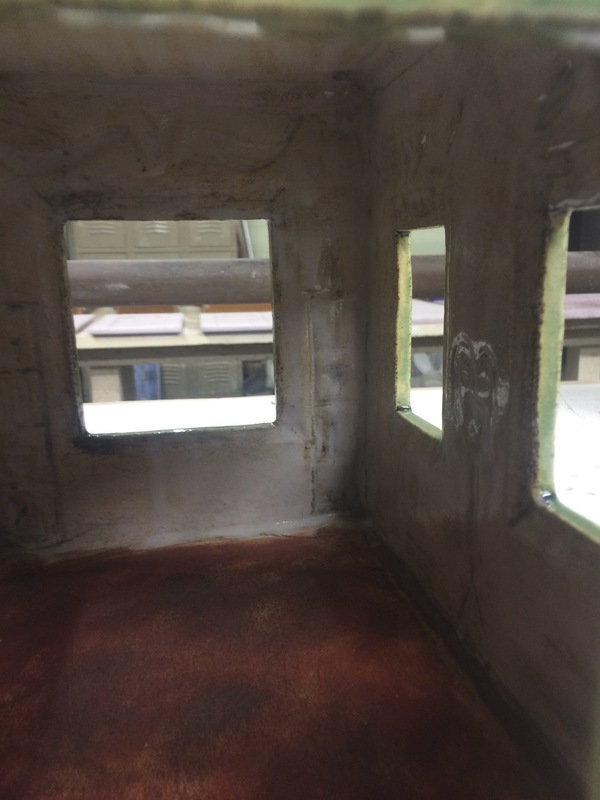 We have since modified the method of movement for them during filming and this may not remain a good decision but it is integral to the finished look of the piece and can not be regretted. Over all, Im am really happy with the way this piece has turned out so far, and the interiors are wonderfully intimate. I’m hoping we can translate that into the character of the film.